Totally renovated with wonderful ocean views. 3 bedroom, 2 bath, living room/dining, kitchen, two balconies. MW, DW, 3 Satellite TVs, DVD, WiFi. ONSITE POOL. NO PETS. NO SMOKING. ONE (1) SET OF BED LINENS & TOWELS PROVIDED. BEDS: 1 King, 1 Queen, 2 Single. Accommodates 6. This unit is located in a very good spot. 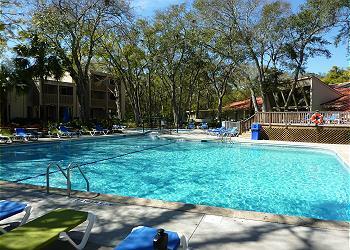 It was convenient to the pool and had very close beach access. The condo was nicely decorated and very clean. My only small complaint would be the air conditioning had a difficult time keeping up on hot days. The thermostat was set on 70 but one day our unit got up to 78. But we do have 3 kids constantly going in and out and we were cooking. Overall we had a wonderful time. The unit was great loved the views.the beds need new mattesses. and their was not enough pot and pan to cook with. the AC did not work right but the staff at Jekyll reality made it their top priorty and it was fixed same day. The location was perfect! The booking, check-in and checkout process were easy. The condo accomifated a family of 5 comfortably. This allowed all of us to be together and experience a relaxing get away as a family. Great overall. Pros: *great* view with beautiful sunrises, older but clean / renovated unit - kitchen with granite counter tops, tastefully decorated and comfortable, *excellent* restaurant on premises, friendly staff, nice pool close by, Driftwood Beach walkable. Cons: no washer/dryer in unit - have to walk to a non-air conditioned coin-operated laundry facility next door (would suggest making machines free and putting in an a/c wall unit), beach in front of unit only usable at low tide - Driftwood Beach a 15 min walk for high tide usage, very pretty. Vacuum cleaner missing from unit and had to ask for broom/dustpan to be brought. Coffee pot died on last couple of days. Fitted sheet on king bed didn't fit and kept popping off during night. Bathrooms need renovations.